Yellowstone, a place near and dear to our hearts, is a park full of intriguing history, fascinating geology, and abundant wildlife. There truly is no other place like it on earth, and we hope this list of 11 fun facts will motivate you to visit our world’s first national park! 1. Did you know that Yellowstone sits atop one of the world’s largest volcanoes? The Yellowstone caldera, left behind by an eruption 640,000 years ago, is approximately 1,000 square miles. That’s roughly the size of Rhode Island! 2. Did you know there are four different types of geothermal features in Yellowstone? You can find them all – geysers, hot springs, mud pots, and fumaroles – at the Fountain Paint Pots boardwalk. 3. Did you know that the president, Ulysses S. Grant, signed the Yellowstone Park Act in 1872 creating the world’s first national park? Amazingly, there were only three expeditions that explored the area over the years of 1869 – 1871 prior to Yellowstone being protected. Thank goodness for great foresight so we can continue to enjoy this special park to this day! 4. Did you know that Old Faithful is the most famous geyser on earth, yet it’s not the tallest geyser in the park? Steamboat Geyser is the world’s tallest active geyser and it’s located in Norris Geyser Basin, about an hour’s drive (with no buffalo jams) from Old Faithful. However, Steamboat’s eruptions are unpredictable and you have to be pretty darn lucky to witness its nearly 400-foot high blast, whereas Old Faithful’s eruptions predictably stick to a schedule; hence, its famous name! 5. Did you know that the Old Faithful Inn, built in 1903-1904, is the brainchild of a 29-year-old architect named Robert Reamer? Most park hotels designed during this time were made to stand out from their surroundings, giving visitors a vision of home that would help calm their fears (if you’ve ever seen Yellowstone’s bright yellow, Queen Anne Victorian-style Lake Hotel, you understand what I’m talking about). Not Old Faithful! It appears to be an extension of the wilderness itself – and we’re happy it turned out this way! 6. Did you know that there isn’t one place in the park where you can see both the Upper and Lower Falls of the Yellowstone River at the same time? This is because after plunging 109 feet over the Upper Falls, the Yellowstone River makes a large S-turn before it plunges another 308 feet over the Lower Falls. Our favorite spot to view the Upper Falls – the brink! Our favorite spot to view the Lower Falls – Artist Point. 7. Did you know that the Madison River Valley just inside the park’s West Entrance is home to one of the only herds of elk that don’t migrate out of the park during the winter months? Most elk migrate to lower elevations during the winter to seek out food as well as shelter during the calving season. This valley though appears to contain everything they need to maintain a year-round presence; hence, the lack of movement! 8. Did you know that Yellowstone Lake is the largest high-alpine lake in North America? Sitting at 7,733 feet above sea level, this lake is better for photographing than swimming. Average summer water temperatures sit at around 45 degrees Fahrenheit! Perfect for a chilly polar bear plunge on a hot summer’s day! 9. Did you know that the two best locations for spotting wildlife (at least, in our humble opinion!) are the Lamar Valley on the northeast side of the park and Hayden Valley in the central part of Yellowstone? We haul along our spotting scopes to search for wolves in Lamar and keep a close eye out for lumbering bears in Hayden Valley. However, you can see any of Yellowstone’s wildlife in either valley (and throughout the park), so keep your eyes peeled! 10. 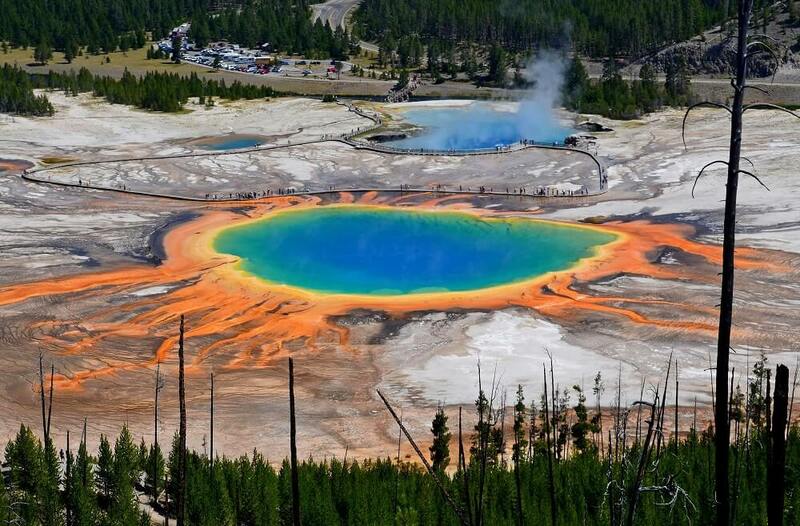 Did you know that Grand Prismatic Spring is the third largest hot spring in the world? It’s located in the Midway Geyser Basin and is 121 feet deep; this spring could swallow a 10+ story building! 11. Did you know that the US army controlled Yellowstone for 32 years in the park’s early history (1886 – 1918)? In 1916, the National Park Service was established and took over the important job of protecting the park. You can learn all about the early history of Yellowstone at the Albright Visitor Center and see many of the army’s original sandstone buildings in the Mammoth Hot Springs area. Truth be told, it’s hard to pick only 11 fun facts to share about Yellowstone, our favorite national park! This wonderland has delighted visitors for over 150 years and can only truly be appreciated through your five senses. When you’re ready to feel the kiss of steam on your face, to breathe deeply of pine-scented air, to watch geyser water sparkle against blue sky and warm sun, and to hear the guttural intensity of an elk bugling to win love, just say the word and we’ll be by your side to help you experience it all. Austin Adventures expertly plans active vacations on all seven continents, but Yellowstone has been our #1 since the day we opened our doors. Find out why by giving one of our Adventure Travel Consultants a call today: 800-575-1540.